I also have an antique storage case that we use as well that apparently I don't have a good picture of. Those the Foremost cubes? Been using those for about 10 years now. While not the prettiest they really get the job done well. They're ok. As I use the black ones, they're not too noticeable. The front of the room where the rolltop deks, CRT TV, speakers, and storage cabinet (upon where the TV rests), etc is all in dark wood, so that side looks nice and when you're in the room, you're pointed away from the foremost cubes. This is gorgeous! Did you build or buy the shelf? I also moved a few months ago, and decided that since my two 2x2 Expedits were basically full, it was time for an upgrade. 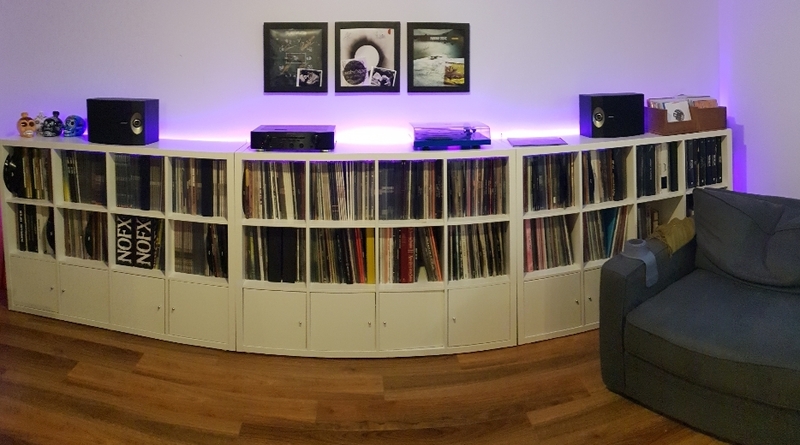 I'm really happy with the new 4x4 Kallax and all of the room I have for expansion! Still not too crazy about having to have my turntable and receiver separate from the shelf, but idk if it would look right having them sitting on top of the Kallax since it's so tall. It would make hooking the speakers up way easier, though... what do y'all think? I like the cabinets along the bottom row a lot. Is that an Ikea thing? Also, What speakers do you have? You can buy those doors as add-ons at IKEA. Great for keeping small pets out of the bottom row. Yep they are the Door inserts that Ikea sell as add ons for the Kallax series. They are a bit of a pain to install but once they are in they look great. Ah! I should've guessed Bose with that horizontal form factor. Out of curiosity, which Wharfedales were you using before? Diamond 10.1s.....i did an A/B test and these sounded so much brighter. But value for money, if i was paying rrp id probably take the Wharfedales, i just happened to get the Bose 301s dirt cheap. Is that a Marantz amp? I think I have the same one. Ah nice one, mine is PM5004.